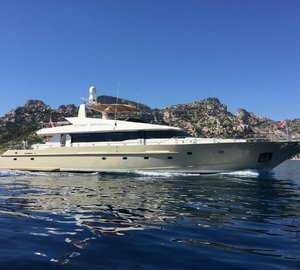 Enjoy 8 days for the price of 7 cruising in the West Mediterranean between France, Italy, Sardinia and Corsica aboard the 43-meter luxury charter yacht FERDY. 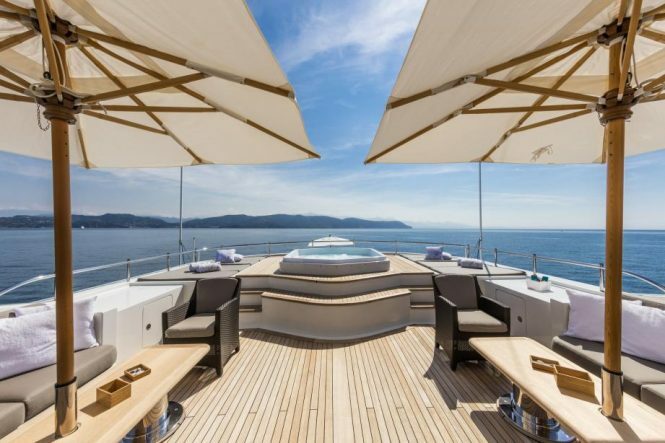 Delivered by Codecasa in 2007, she has in-house exterior styling and interiors by Della Role Design. Accommodation is provided in 5 cabins, for up to 12 charter guests. The interior décor is contemporary and minimalist, featuring neutral soft furnishings, pale woods and accents of colour from custom additions. The main salon is generous, with 2 lounge areas, one aft with a social ambience, the other forward, offering a wrap around U shaped sofa, coffee table and entertainment systems. On the upper bridge deck is the formal dining table, seating guests in elegance. 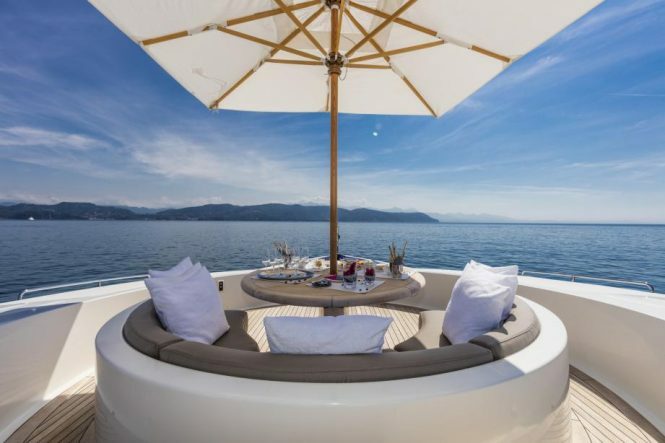 M/Y FERDY has good exterior living areas laid over 3 levels. The aft deck is partially shaded with a lovely seating area and casual table, perfect for cocktails. Her upper aft deck boasts alfresco dining, seating and partial shade, this is adjacent to the formal dining room. Side decks lead from the upper deck to the Portuguese styled bow, where an intimate seating and table arrangement make for a great private retreat. The sundeck is complete with a deluxe jacuzzi, sun pads, comfortable seating space with optional shade. 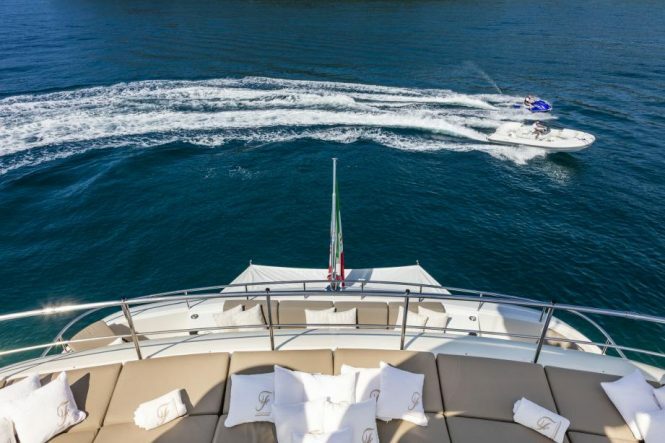 Accommodation aboard the Codecasa yacht is in 1 main deck master stateroom situated forward, with a full beam layout and separate his and hers facilities. On the lower deck are 2 double and 2 twin cabins, all en-suite. Each twin cabin offers an upper Pullman berth. 2 x CAT engines power the yacht with speeds of 15 – 17 knots. She is fitted with zero speed stabilizers for optimal comfort. 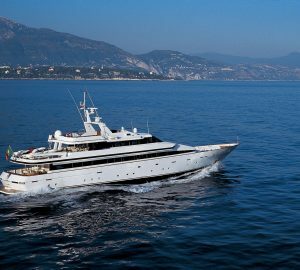 Please contact CharterWorld - the luxury yacht charter specialist - for more on superyacht news item "43m Charter Yacht FERDY Offering '8 Days for a Price of 7' in the West Med".